Hello! 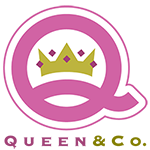 Queen & Co. has done it again with their shaker kits! 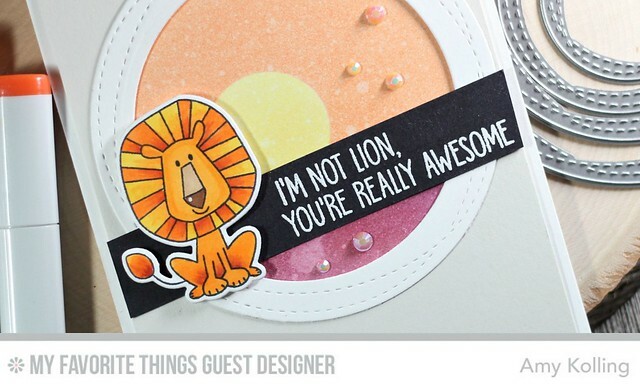 I am sharing some STAR shakers that make great cards for any occasion. The star dies that are included in this kit have stitching around the edges....I love this detail! 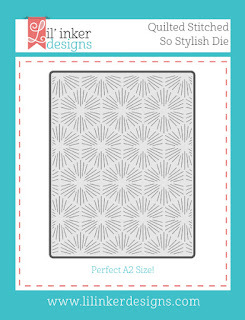 My first card starts with cutting 5/8" strips of the larger polka dot print papers from Delightful Dots. The strips were added to a piece of cardstock and trimmed all the edges for a clean look to my panel. My shaker was made using one of star dies with white cardstock. 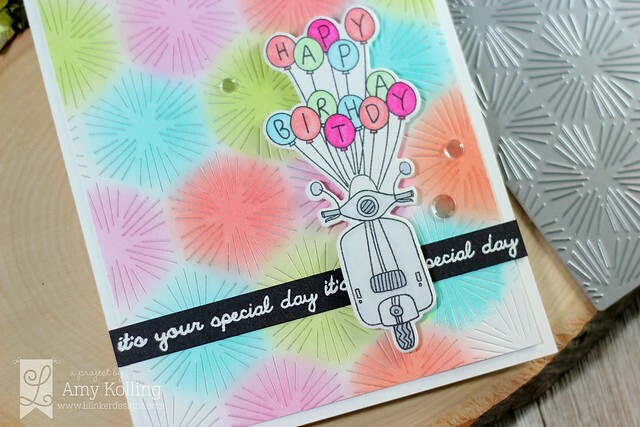 I filled my star shaker with Pastel Diamond Toppings in all colors to go with the rainbow theme of my card. To finish, my sentiment, from the Star Shaped Kit, was white heat embossed onto a hand trimmed black banner. My second card uses an "inlaid" technique so that my card is flat but still has the shaker element. I started making my inlaid shakers by die cutting the stars in a panel of white cardstock. Using this panel as a guide, I laid this panel over my notecard and added the foam shaker outlines to the panel. After removing my panel, lots of foam adhesive was added to the back and added to my notecard. I filled each star with various coordinating colors of Bubbles Toppings and sealed my shakers. I die cut the stars out of cardstock and inlaid them over the shaker to hide them. 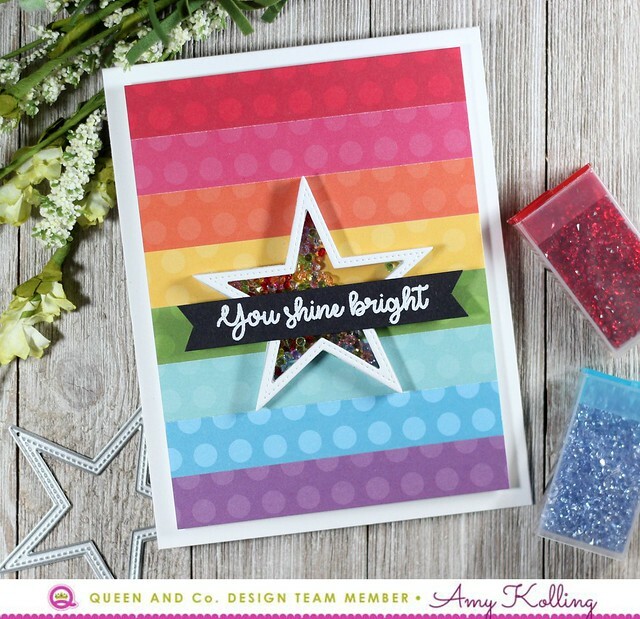 A few small star die cuts were added along with Iridescent Rhinestones. 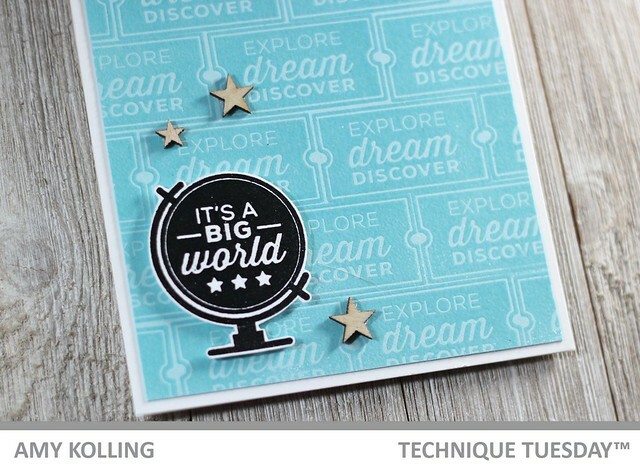 Lastly, a simple stamped sentiment banner was added across the middle star. Today starts the countdown to the Technique Tuesday August release! 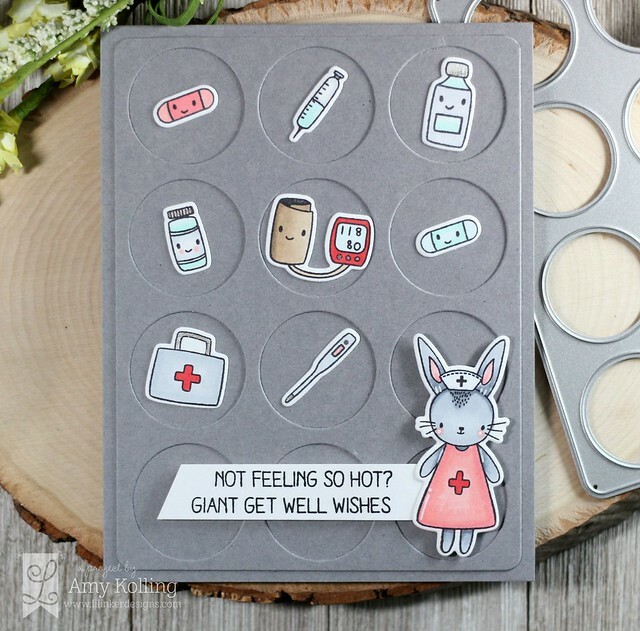 There are fun stamps and dies that to help you with your travels, flowers, and more! I thought the Travel Buddy stamp set would be perfect for an encouragement or graduation card. 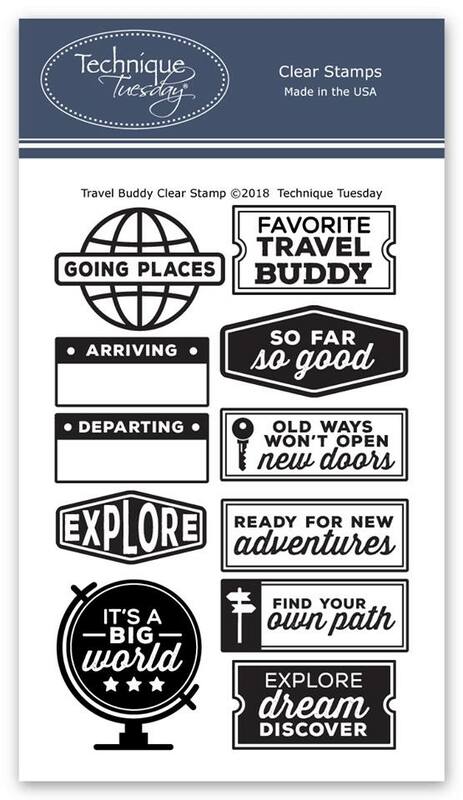 I stamped the 'explore dream discover' stamp repeatedly in Versamark to create my own background paper and clear heat embossed the whole panel. Because I really wanted the 'It's a Big World' globe to stand out, I black heat embossed this and hand trimmed out. I added the globe image to the panel with foam adhesive and adhered a few wood veneer stars. Hello! 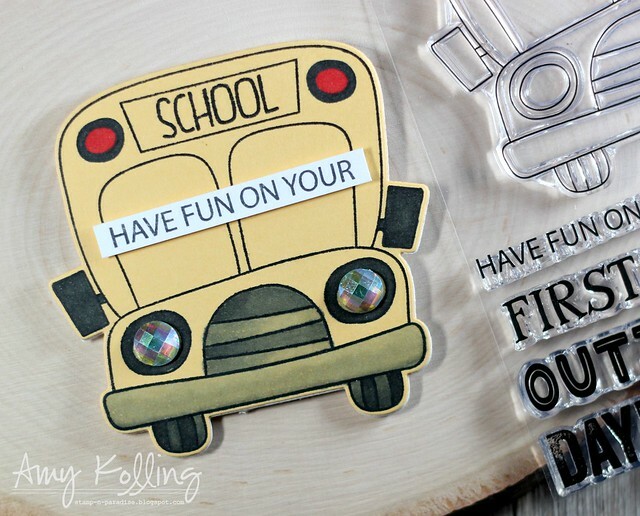 I am here to share a quick peek at a mini shaped card I made using the School Bus Messages set releasing from Simon Says Stamp as part of their Friendly Frolic release! There has been quite the discussion at our house the past few weeks about how my daughter will get to school now that she is starting Middle School this fall. Ride with brother? Nah. She wants to ride the bus!!! Sleep in later if she rides with brother? Nah. She wants to ride the bus!!! So this stamp set and die is PERFECT for our little family right now. I created a shaped card using the bus die and added a stamped/die cut bus image onto yellow carstock to keep this super simple since it's going to my daughter. She will get a smile out of this for sure! The inside reads......first day. 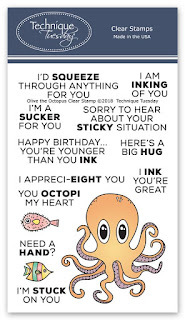 ♥ you. Hello! 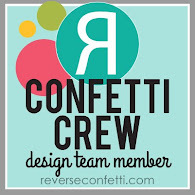 I am excited but sad as this week is my last post as the Guest Designer for the My Favorite Things Wednesday Sketch Challenge! This week's sketch was perfect to create a little "scene" with the adorable lion from Safari Friends. 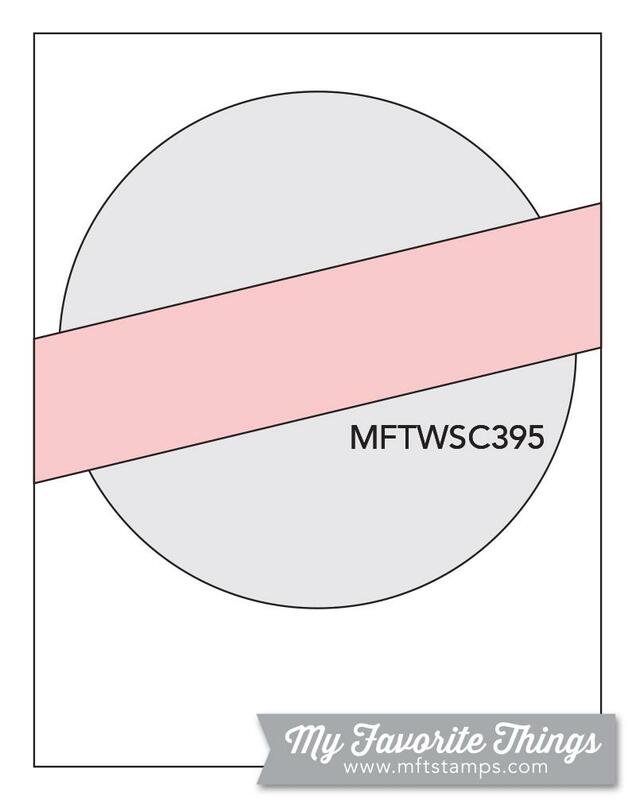 I created my circle frame using the Wonky Stitched Circles. I layered my frame over a background inked with Distress Inks for a sunset sky. I selectively inked up my sentiment so that it could be white heat embossed on two lines. I hope you'll play along with us this week! 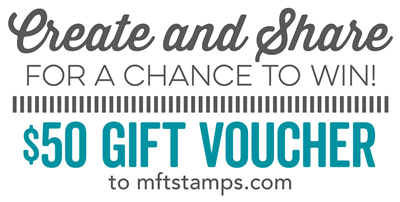 Simply link up your creations HERE for a chance to win a $50 gift voucher to spend at the My Favorite Things store. 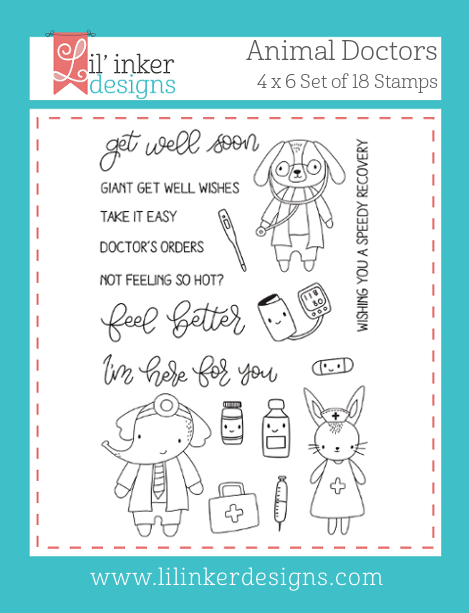 We are starting off Day 3 of the Lil' Inker Designs July Release! 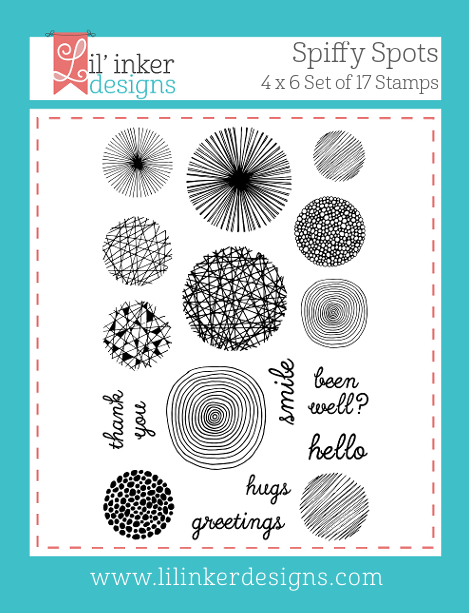 This release is FULL of amazing dies and stamps for some fun occasions......are you ready? Guess what?? The whole new release is now available and can be found HERE!!! 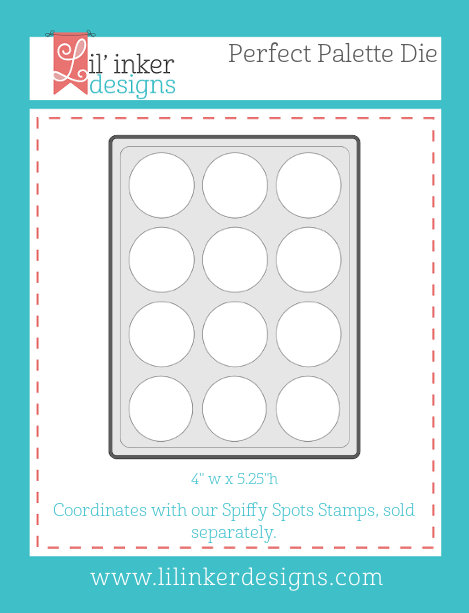 Spiffy Spots was so fun and easy to make this set of thank you cards! 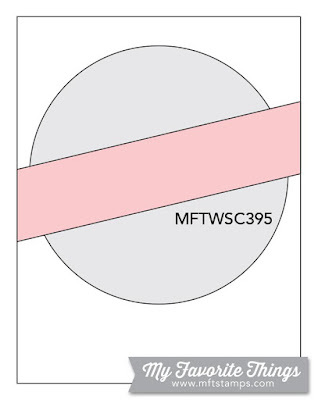 To make this super easy, I die cut the Perfect Palette Die out of white cardstock and adhered it to the lid of my Misti for easy placement and stamping of my circle stamps onto the colored panels of cardstock. 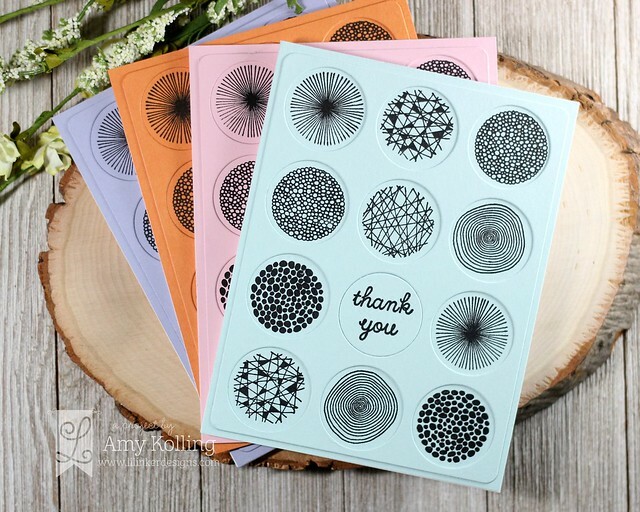 To finish, I added the coordinating die cut Perfect Palette to the panel as well as one stamped 'thank you' onto one of the circles. 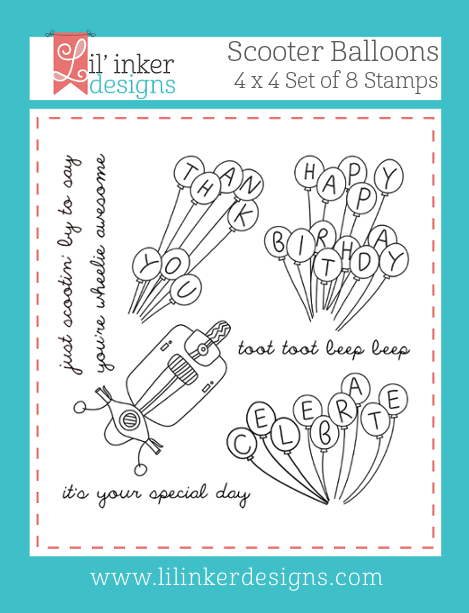 We are starting off Day 2 of the Lil' Inker Designs July Release! This release is FULL of amazing dies and stamps for some fun occasions......are you ready? Guess what?? The whole new release is now available and can be found HERE!!! 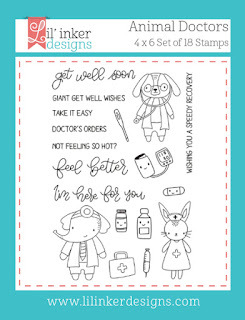 Lil' Inker Designs has AMAZING cover up dies! 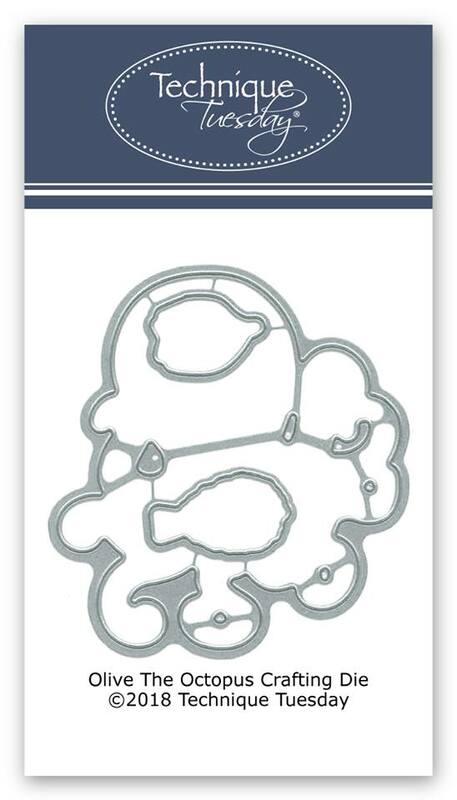 (Find them HERE!) Well, we've added one more......Quilted Stitched So Stylish. I can't wait to use this die more! I have lots of ideas! The hexagons in this pattern were perfect to drop in color. I ink blended Peacock Feathers, Picked Raspberry, Twisted Citron, and Abandoned Coral Distress Inks using a round applicator randomly over the panel. I trimmed the panel and adhered to a top folding white notecard. 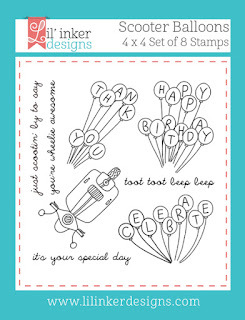 I added scooter from the new Scooter Balloons set and chose the sentiment Happy Birthday. What's so fun is that there are THREE to choose from! After Copic coloring and die cutting, I added my scooter with foam adhesive over a white heat embossed black sentiment strip. Hello everyone! 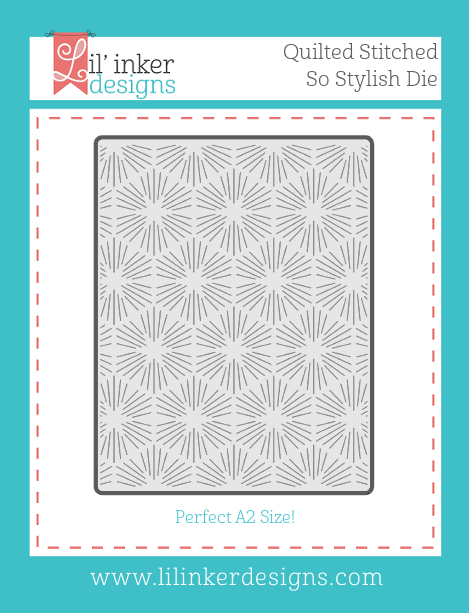 I am sharing a new project using the Hello Bluebird July release! 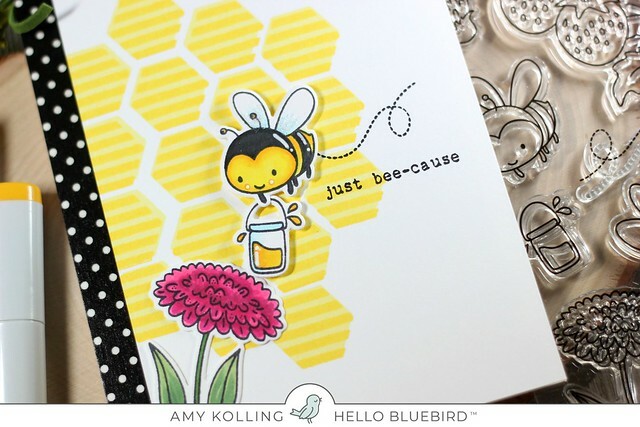 My favorite set from this release is Bee Happy with all those adorable bee images! I created my own honeycomb pattern in the background left justified using dye inks and the hexagon stamps included in this set. 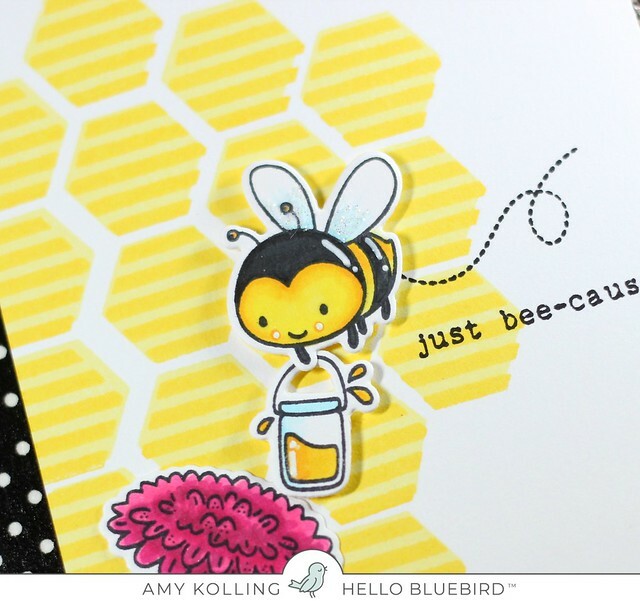 Images were all Copic colored and die cut with the coordinating Bee Happy dies. 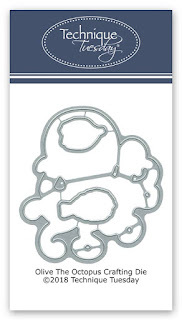 The images were added, some with foam adhesive to the stamped panel after the "trail" and sentiment were stamped. 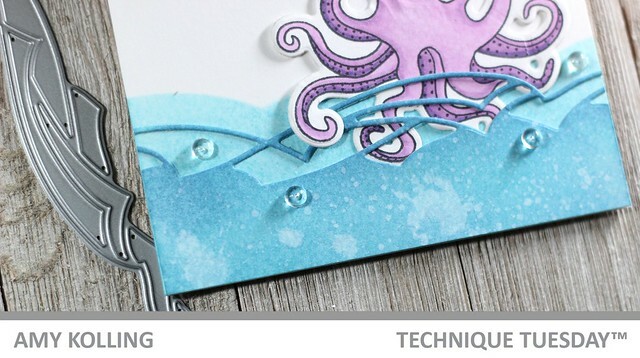 This panel was trimmed as it was adhered to a white notecard with black polka dot washi tape on the left. Last detail was to add white pigment ink accents to the images and some glitter to the wings! 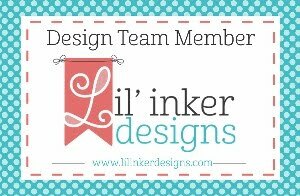 We are starting off Day 1 of the Lil' Inker Designs July Release! 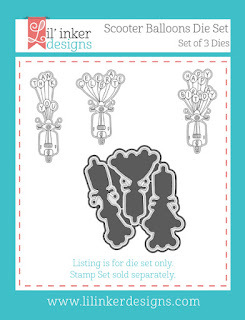 This release is FULL of amazing dies and stamps for some fun occasions......are you ready? Guess what?? The whole new release is now available and can be found HERE!!! Animal Doctors is an adorable set and so fitting I showcase it today. Being a RN, this set will get some love me!! I thought it would be fun to show case all the smaller images in this set. 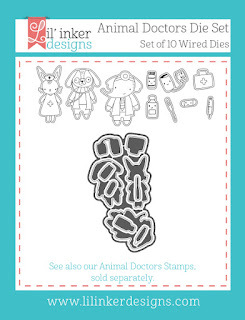 All images were Copic colored and die cut using the Animal Doctors Dies. 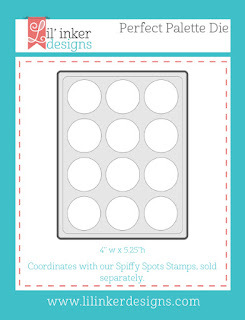 They were all adhered inside the cut out circles from the Perfect Palette Die which was done in grey cardstock. 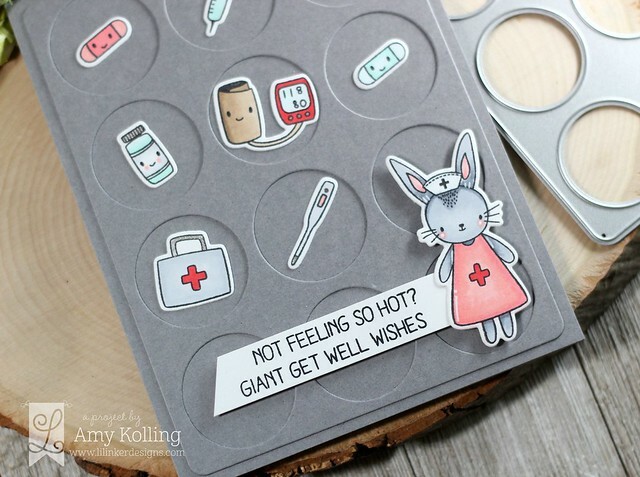 I added the cute bunny nurse with foam adhesive over a sentiment banner.